My youngest daughter's gymnastics class was cancelled yesterday evening and, since we were actually going to be home for a change, my wife suggested spaghetti for dinner. I had to run to the store anyway so, while I was there, I picked up this brand of meatballs to go with it. I couldn't remember if I had this brand before and only purchased it because the $2.49 price seemed somewhat reasonable compared to the other brands I had to choose from (it was about $4 less). I ended up heating them up and adding them to the sauce and, overall, I have to say I was happy with the purchase. There weren't a whole lot of meatballs in the packaging. But, other than that, I really couldn't find anything negative to say about them. 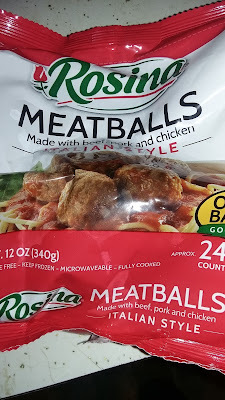 While they weren't the best frozen meatballs I've ever purchased, I thought they were decent enough for the money. The Italian-style meatballs had a good blend of seasonings on them. They weren't too spicy. But, at the same time, they had enough flavor to make them noticeable, even after I added them to the sauce. At minimum, they were an improvement over some of the very bland meatballs I've purchased from other brands in the past. The meatballs also surprised me a bit because they weren't as greasy as I was expecting them to be. There were definitely some juices from them. However, the quantity was minimal and, again, I've had other brands that were much worse than that. The lack of grease did make them more appetizing as a result. Final Opinion: Overall, I thought this was a good purchase. As I said before, it wasn't the best brand of frozen meatballs I've ever purchased. However, considering the lower price, it was a decent-enough product for me to consider purchasing it again.